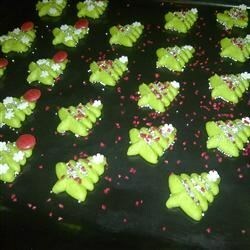 "Cookie press cookies topped with red and green candied cherries." Cream together butter and confectioner's sugar in bowl until light and fluffy, using electric mixer at medium speed. Beat in egg, egg yolk and almond extract; blend well. Gradually stir flour into creamed mixture, mixing well. Fit flower crown design into cookie press. Place 1/2 of the dough in cookie press at a time, forcing dough through press, about 1 inch apart, on ungreased baking sheets. Place 1/4 of a red or green candied cherry in center of each. Bake in 400 degrees F (200 degrees C) oven 7-10 minutes or until set but not browned. Remove from baking sheets; cool on racks. See how to use a cookie press to make incredibly beautiful Christmas cookies. My mom made these almost every Christmas. Always with the tree press and green food coloring (like the photo). I love them! I haven't made these, but they sure sound festive!!! These were not to my liking; dough was too tough for a spritz cookie and they tasted like flour. Very easy to do with my pampered chef cookie press! I added a little extra sugar and put red cinnamon candies on top of a Christmas tree shaped cookie. Very pretty! These were not to my liking. No taste and hard to mix. My kids were very disappointed and I would not serve these.